There are many styles and shapes of transfer boards designed to safely move a disabled person from one location to another with or without assistance. The boards are designed to bear the weight of the person moving from such places as chair to bed or chair to toilet and back. These are just a few scenarios where handicap transfer boards can be used. They can be used in most furniture or wheelchair to automobile transfers as long as both structures are stable. Boards can be made of different heavy duty materials but all of them are very slippery in order to aid in a sliding transfer of the handicapped person from one spot to another. Wheelchair Users – Very useful when transferring to and from a toilet, transferring to and from a vehicle, transferring to and from a bed or transferring to and from a bathtub. Notches or anti-slip tape placed underneath the transfer boards provide traction and support during the transfers. Amputees – Scoot along the handicap sliding transfer board and use your hands or a caregiver as assistance. The slickness of some boards like the ultraslick transfer board makes the process easier. Elderly – Provides a platform to easily slide from one area to the next. Caregivers – For some caregivers who need to lift heavier patients, these handicap transfer boards can support 400lbs and over. Instead of using a Hoyer lift, a patient can be put on a wheelchair from a bed with a simple sturdy board. It may seem counterintuitive to use a slippery object with a person who is disabled, but the slick surface of transfer boards makes it easy to carry out the process with minimal discomfort and exertion for both the person being transferred and the assistant. Depending on the disabilities, a person who has excellent control of his trunk and superb upper body strength may still find using a wheelchair transfer board useful to avoid falling when moving out of or into a wheelchair. Some boards have pliable surfaces to offer a bit of cushioning but are still smooth to allow the person to be easily transferred. There are shapes and styles available depending on need and the type of transfers being done. There are general purpose transfer boards and boards with tapered ends. Tapered ends allow a more comfortable move from the surface one is on to the board itself, and it eases the transition from the board to the surface one is being moved to. There are no rough edges to get clothing or skin hung up on. 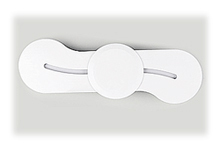 Handicap transfer boards are available from most medical supply outlets or online medical stores and range in price from about $40.00 to over $200.00. Buying a standard transfer board with no notches, cut outs or added features will be on the lower end of the price spectrum. For the higher priced transfer boards, there are built on transfer board swivel seats that can be slid from one side to the other. Average lengths for handicap transfer boards range from 24 inches to 32 inches. Curved Transfer Boards – Curved boards have a 360 degree handicap transfer board swivel seat that allows for a wide range of motion. The seat underneath allows you to slide from one side to the other. With a 27 inch length, these curved boards provide ample size for most transferring environments. Wood Transfer Boards – Boards made of heavy duty wood are made of multiple layers of wood glued together to form a plywood that is extremely strong. The outer layer of wood is smooth sanded and finished to a high gloss smooth surface. Even with multiple layers of strong wooden materials, they are still lightweight and portable. An easy slide slick coating is added to the surface of the wood making it very easy to slide from one end to the other without the fear of clothing catching on the board. 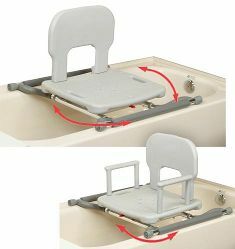 Bathtub Transfer Seats – Place this on top of a standard bathtub and you can have a swivel seat that moves 360 degrees, locking every 90 degrees. Installs on top of tub walls. Supports 250 lbs, has an armrest and backrest for comfort. Transfer Boards with Anti Slip Tape – Has anti-slip tape underneath the transfer board to maintain traction between the two transferring positions. Includes holes on each end of the board where you can place your hand for extra grip and support. Has a slick surface and a weight capacity of 250 lbs. Plastic Transfer Boards – Plastic boards are reinforced and are molded to have a slick surface. Plastic will not splinter or chip. However, wooden boards are tough and can last a lifetime if properly used and stored. Made of plastic but very sturdy and is the cheapest transfer board. Perfect for anyone weighing 220lbs. Comes simple and does not have any additional features. Another plastic board that is affordable and is very slick is the ultra slick transfer board. This one supports up to 250lbs. Experienced caregivers have found that after using these wheelchair transfer boards, high Quads are now able to transfer independently. This ultra slick transfer board is also good for wet transfers such as those in a bathroom environment. In addition, if you place this ultra slick board on a bed, it can be a bed slider for handicapped, allowing the individual to easily move across the surface of the bed. Are Transfer Boards Covered by Medicare or Insurance? Since these transfer boards can be considered medically necessary as defined by a private insurer like Aetna and required for assisting in bed to wheelchair or wheelchair chair to toilet transfers, your insurance may help pay for it. However, transfer boards can be primarily used by caregivers to assist in lifting and transferring patients. Due to these boards benefiting the caregivers more than the handicapped, Medicare’s definition will likely not allow for payment of these items. But there is a caveat here and that is if the person has a medical condition that limits their ability to transfer from the wheelchair to beds, chairs or toilets. Make sure to read the Medicare requirements for handicapped equipment. As with all medical equipment coverage, be sure to understand your insurer’s definition of what is considered medically necessary and allowed. Depending on the situation of the person needing a handicap transfer board, there may actually be a need for more than one board. If the disabled person will be using the board himself, it is good to have one ready in each location where a board will be needed. Place a toilet transfer board in your bathroom for toilet transfers. Have another near the front door to bring along for wheelchair to car transfers. A simple way to stow the boards is to hang them on a hook attached to a wall or inside a closet if it is desired to store them out of sight. Handicap transfer boards can reduce the stress of moving and may encourage more movement due to the extra feeling of having support when transferring.